Jury deliberations began Wednesday morning in the case of a Chicago businessman charged with aiding the November 2008 Mumbai terrorist strike. The attacks were carried out by armed militants from the Pakistan-based terrorist group Lashkar-e-Tayyiba (LeT). Tahawwur Rana's immigration company provided cover to American Lashkar operative David Headley to scout targets for the attacks. Prosecutors say this was because he supported the attacks. Rana is charged with supporting the Mumbai plot, along with a plot in Denmark that was not carried out, and with support for the LeT. Defense attorneys say he was manipulated by Headley, a childhood friend. Headley pleaded guilty in March 2010 and was the prosecution's star witness in the trial. Headley admits making several trips to India to scout targets for the attacks, which killed more than 160 people, including six Americans. "Rana helped Headley in his deadly plans," Assistant U.S. Attorney Victoria Peters told jurors during closing arguments Tuesday. "He knows exactly who David Headley is and what David Headley is about and he fully approves." The trial garnered international attention because much of the testimony and evidence implicated Pakistan's Inter Services Intelligence agency in the Mumbai plot. But in closing arguments, attorneys primarily focused on the actions of the defendant and his chief accuser. Peters pointed to evidence, including e-mails, tape recordings and videotaped admissions, tying Rana to the Mumbai attacks and other plots. Those records show it was not just Headley's word that led to Rana's prosecution. Headley's testimony was "corroborated over and over" by other evidence presented at the trial, she said. Defense attorneys have challenged Headley's credibility, saying he lied and that he agreed to testify against Rana to avoid the death penalty. Defense attorney Patrick Blegen described Headley as a "lifelong liar, con man." "He covers, he manipulates, he hides the truth, he tells something to someone and something else to someone else," Blegen told jurors. But Peters pointed to a recorded conversation Headley had with Rana during a long car ride on Sept. 7, 2009. In it, Headley and Rana discussed multiple targets for attacks. Headley earlier mentioned four targets including Denmark but then corrected himself, saying "oh my friend, not four, five, five," which resulted in laughter from Rana. Headley then said "Defense College" twice, to which Rana replied "right, this is it. I knew already." The Denmark target referred to a plot to attack the offices of the Danish newspaper, Jyllands Posten. The newspaper's 2005 publication of cartoons depicting the prophet Muhammad had unleashed a wave of violent protests across the Muslim world. "Defense College" alluded to India's National Defense College in New Delhi, a premier defense academy frequented by high-ranking military officials. 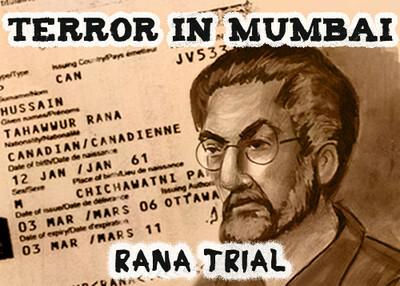 Later in the recording, Rana referred to Sajid Mir, the chief architect of the Mumbai attacks, as "top class," and asked Headley to "pass along the message" to him. He also said that Lashkar fighters killed in the Mumbai assault should be given the Nishaan-e-Haider, Pakistan's highest award for bravery. Rana was "employing heightened security measures" to communicate with Headley in the months preceding the Mumbai attacks, Peters said. "He was embedding one e-mail into another," she said in reference to a July 7, 2008 e-mail from a Pakistani intelligence official Major Iqbal to Rana inquiring about Headley. Iqbal was one of Headley's handlers in the Mumbai attacks. Peters spoke about another e-mail from Sajid Mir to Headley, in which the Lashkar operative asked Headley to give his "regards to doc guy." Mir's familiarity with Rana shows he was part "part of the inner circle," she said. Rana would never support Headley in his jihadist endeavors, Blegen said, because they had opposing religious beliefs. Rana is a Deobandi Muslim, and for jihad to appeal to a Deobandi "a state ruler must declare war." Lashkar, on the other hand, is a Salafi organization and could declare jihad independently of the state. Abdur Rehman Hashim Syed (also known as "Pasha") is a retired Pakistani army major and co-defendant in the case. He connected Headley with al-Qaida commander Ilyas Kashmiri to pursue the Denmark operation after Lashkar backed off. Rana's attorneys claim the meeting was to discuss potential business ventures. It has been reported that Kashmiri was killed last week by a U.S. drone strike in Pakistan, although U.S. officials have been unable to confirm his death. Blegen argued that Rana wanted to set up an office in Denmark with the aim of expanding his immigration business and not as a cover for Headley's surveillance operations. Headley alternately referred to the Denmark plot as the Mickey Mouse Project, MMP, Northern Project, and NP in e-mail exchanges with individuals involved in the operation. But Headley never used those terms in exchanges with Rana and always titled his e-mails as "Copenhagen," Blegen said. He pointed to a video from Headley's earlier interrogation with the FBI in which Headley tells interrogators "I want some busts. I want arrests. All this is on me." Headley was "desperate for a deal" and he "sacrificed Rana for himself and his family," Blegen said. In the prosecution's rebuttal argument, prosecutor Daniel Collins said Rana supported Headley in his endeavors and there was evidence outside of Headley's testimony that proved Rana was guilty. "What we laid out in the case has nothing to do with Headley—it's the evidence in the case and the defendant's own words," Collins said. Rana knew about Headley's ties to LeT and his training with the terrorist group, Collins said. Despite that, Rana went ahead with printed business cards for his friend "a trained terrorist seeking death and violence in Denmark." The business cards were created to authenticate Headley's cover and provide him access to the offices of Jyllands Posten. Collins further argued that Headley did not need to fly to Denmark to place an advertisement in the newspaper. He could easily have done that by fax, e-mail, or a telephone call from the United States. Collins warned jurors against isolating the evidence and said they must consider the case in "the light of all evidence." "Regardless of whether you play a material support role, or carry a gun you have to be responsible," he said.